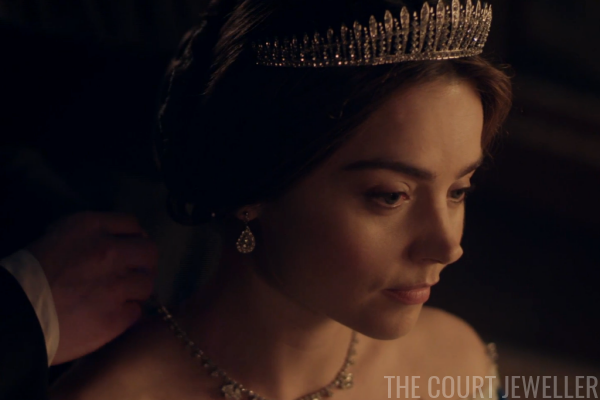 The episode opens with a close-up of Victoria's engagement and wedding rings. 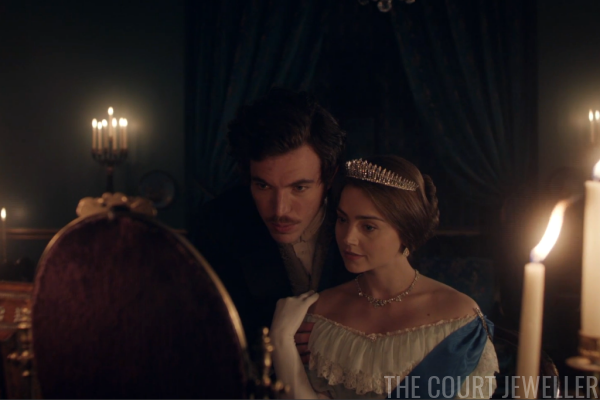 It looks like the production has attempted to replicate the real ring that Albert gave Victoria when they were engaged: a golden snake ring with an emerald set in its head. It seems like an extremely strange choice to us now, but snakes were popular design emblems in nineteenth-century jewelry, because they represented eternity and everlasting love. 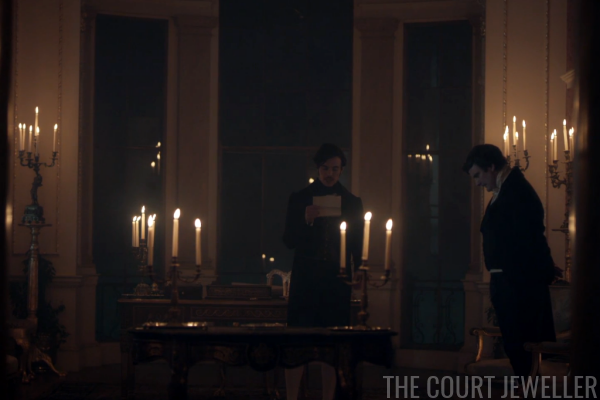 Victoria and Albert are in the middle of some very romantic private time until -- oops! 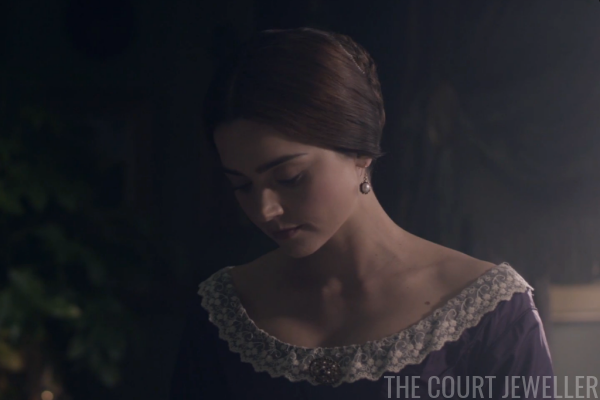 -- Lehzen accidentally walks right in. Time to move the Baroness to a different part of the palace, clearly. 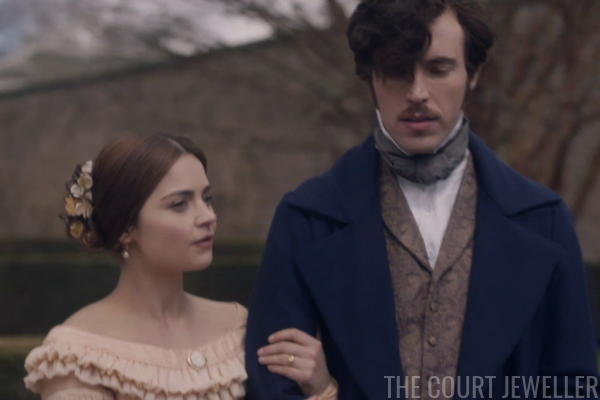 Victoria, wearing pearl earrings, a brooch, and her new rings, strolls with Albert through the palace gardens. They discuss his place in the order of precedence, and then they end up talking about their future children. 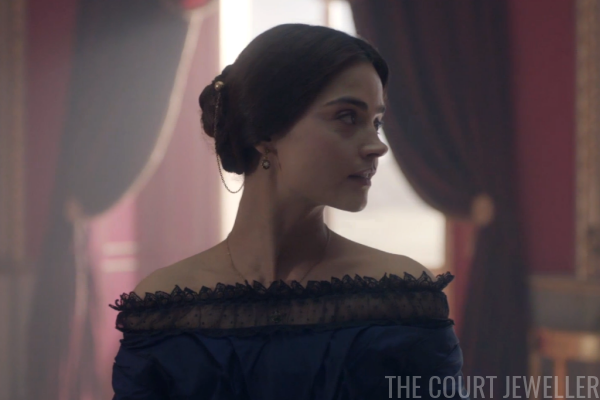 Victoria gets down to the business of reigning in the same earrings and a different gown/brooch. (Another continuity error? I don't think any time is supposed to have passed.) Albert offers to help, but she asks him just to play her something on the piano instead. His day gets even worse when his private secretary corrects the way he pronounces strange English words, like "Leicester." Albert does NOT like Englishmen correcting him. Frustrated, Albert starts pacing through the palace, picking at this and noticing dust on that. He passes by the rest of the Courtier Gang hanging out by the portrait of Elizabeth I, drinking tea while Ernst sketches Harriet Sutherland. These are their hilarous faces as they realize that Albert is on the verge of a tantrum. 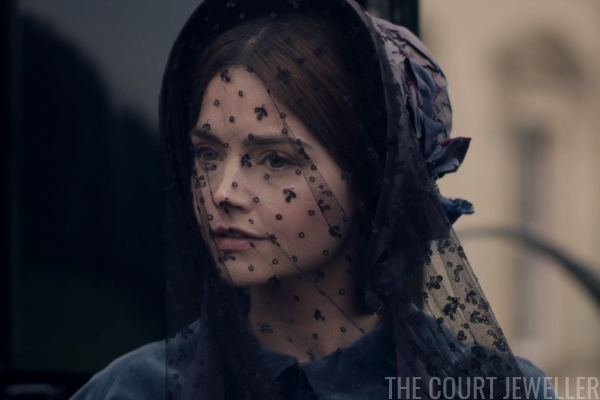 Victoria heads it off by calling for Albert to come and help her out. Appropriately, she's wearing the little hair combs that sort of look like crowns while she works. He's pretty disappointed, though, when he realizes that she just wants him to blot her signature, not read and comment on any of the state papers. 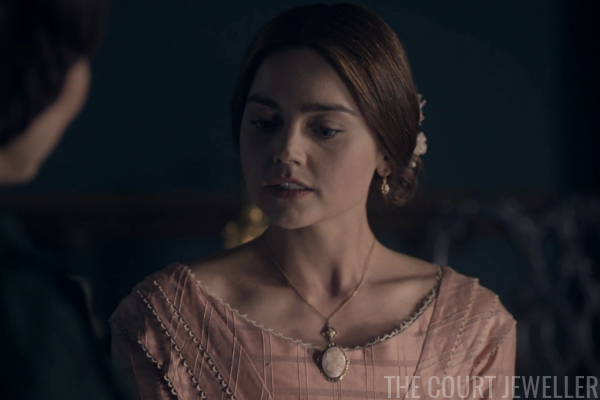 Later, as Victoria dresses for a state dinner, Albert comes in and takes over the job of fastening her diamond necklace from her dresser. 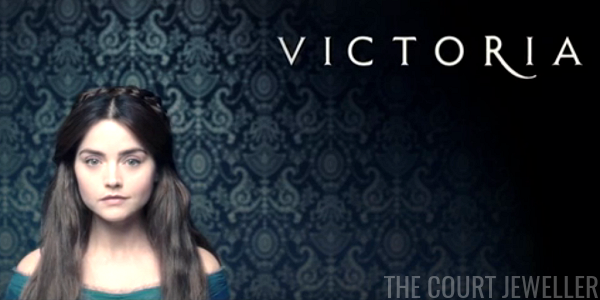 For the second episode in a row, Vic's wearing her diamond fringe tiara, a piece she really owned. 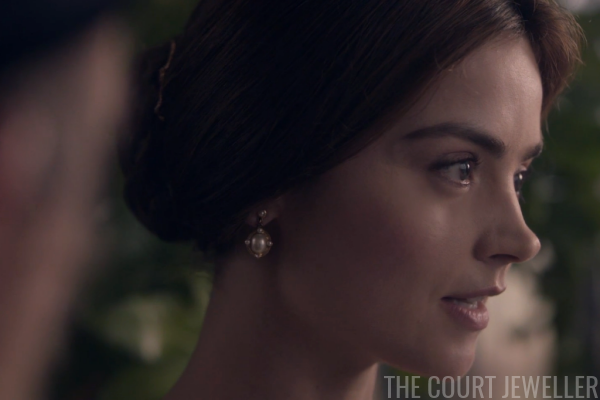 As they leave, we get a good look at the diamond comb in the back of Victoria's hair. 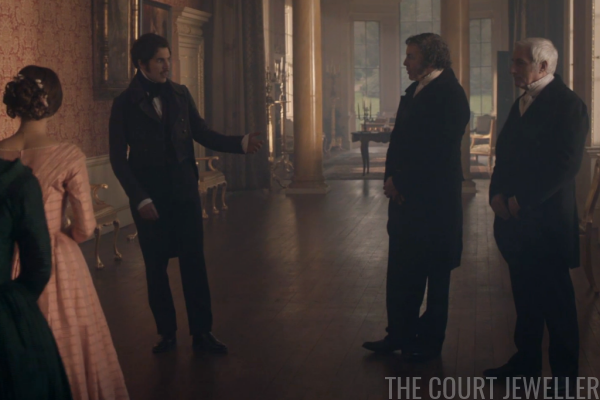 When they arrive at dinner, Albert is announced as "His Royal Highness" -- he really did receive an upgrade from HSH to HRH just before he married Victoria. 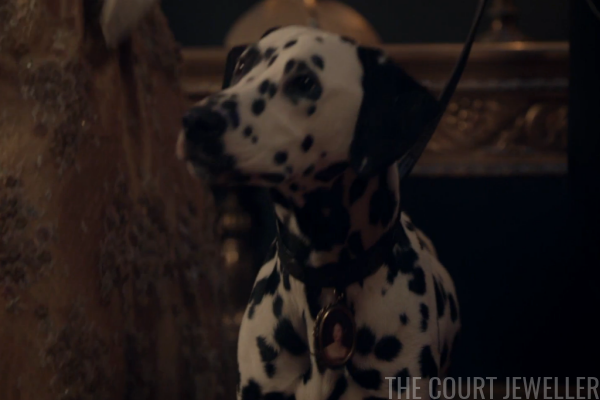 And curiously, his dalmatian, "Mr. Bumps," has a matching one on his collar. Albert asks if all English dogs wear jewelry; Alfred explains that the dog was so jealous of his miniature that he got him one of his own. 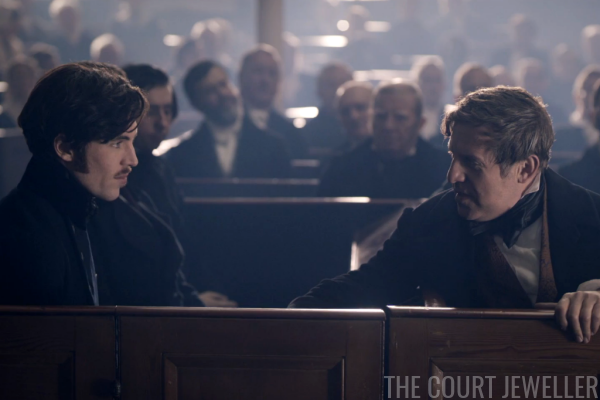 Albert goes away grumbling to Ernst and mutters one of my favorite lines of the episode: "Dogs wear jewelry! The pianos are out of tune! And all the people talk about is the weather!" Indeed, Albert, indeed. 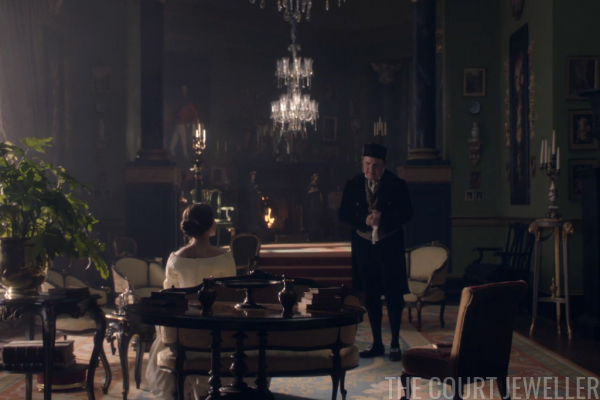 Things get even grimmer for Albert when Victoria, bowing to the pressure of tradition, lets Uncle Sussex take precedence over Albert and lead her into dinner. 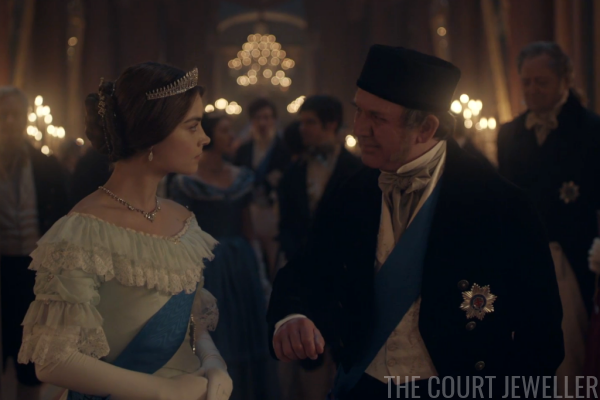 Harriet Sutherland, who goes in to dinner with the flirtateous Prince Ernst, appears to be wearing a replica of the Cambridge Lover's Knot Tiara, which is a pretty strange choice on the part of the production. 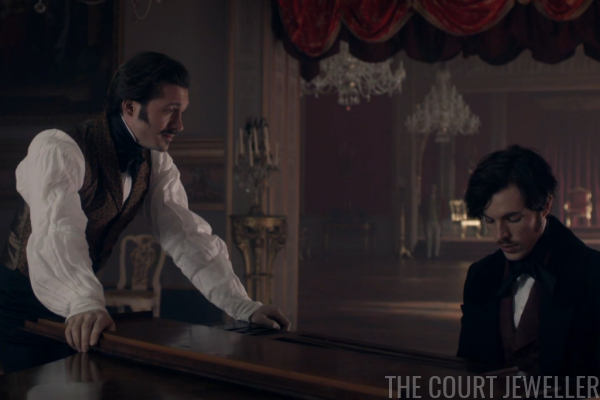 Albert plays broody German piano music; Ernst interrupts and urges his brother to get on the baby-making bandwagon, because things will be much better when there's a little Vic or Al running around. Albert's still frustrated. He wants to carve out his own role. 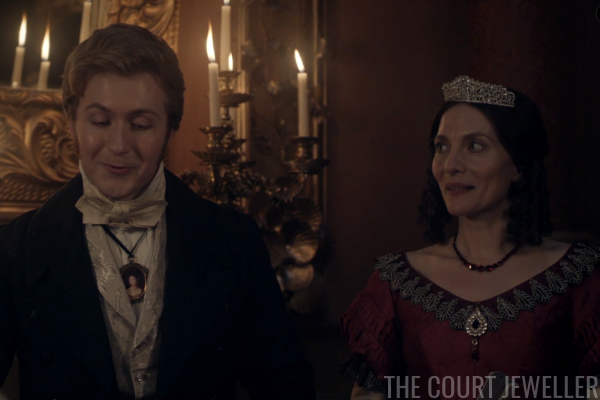 Meanwhile, Victoria gets advice on dealing with Uncle Sussex from Emma, whose forehead pendant has grown so large that it's even bigger than her brooch. 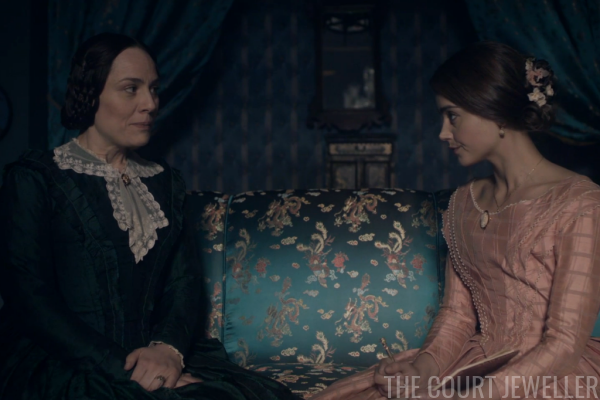 We get a good look at Victoria's little earrings as she asks Emma whether Sussex has a mistress. 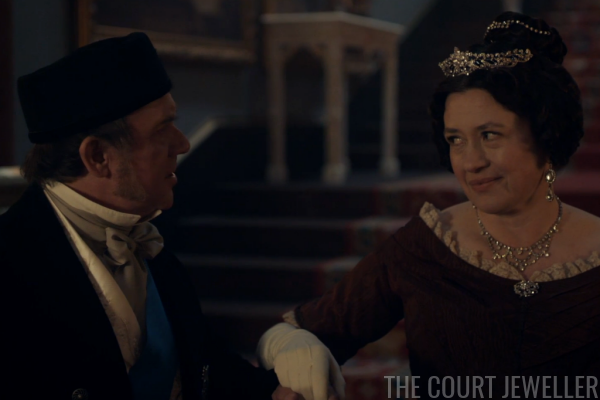 Emma surprises her with the news that Sussex is happily married -- but that his wife, Lady Cecilia, isn't recognized because their marriage was in contravention of the Royal Marriages Act. 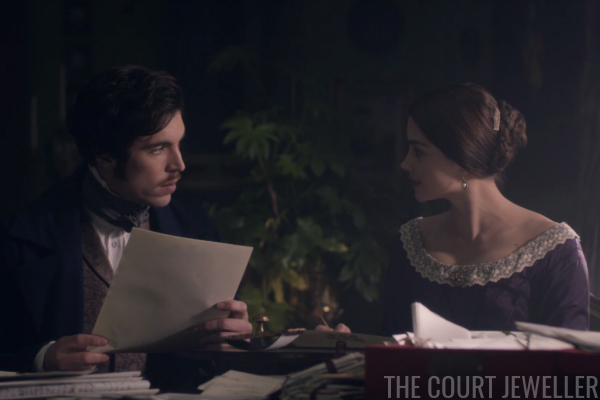 Victoria has an audience with two anti-slavery society members, and she invites Albert to be present. They ask Victoria if she will lend her support by official opening their upcoming convention. She offers her monetary support, but she notes that the sovereign can't open the meeting, even though she would like to. Albert perks up at all of this. 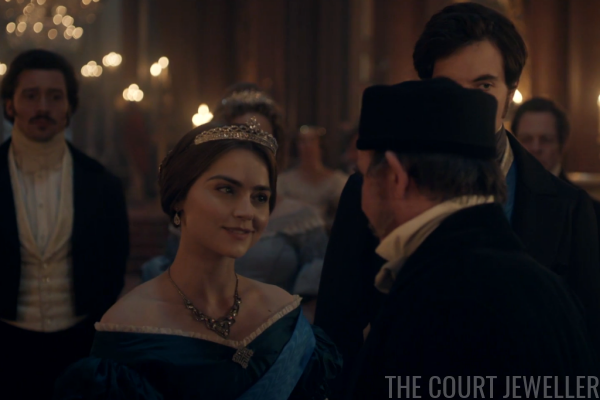 Later, Victoria (who wears a carved brooch with a delicate pendant and earrings) calls Lehzen in for a chat. 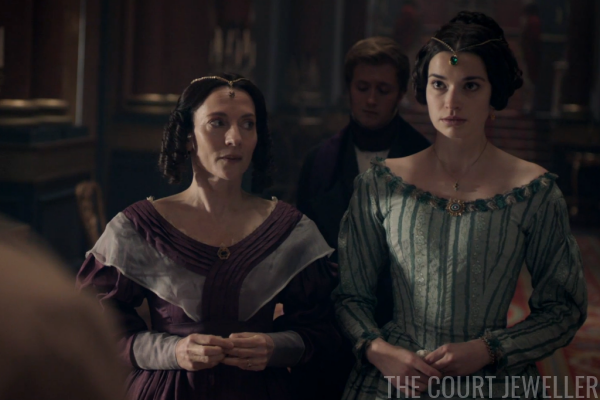 In a roundabout way, she asks Lehzen about ways to prevent a pregnancy for, oh, maybe a year. 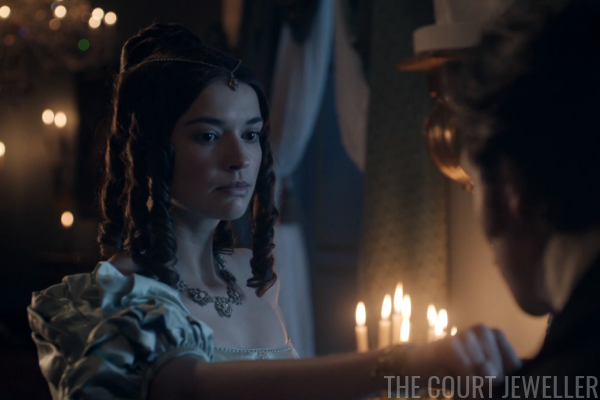 She doesn't want to die in childbirth like Princess Charlotte did. In the meantime, Albert has decided that he's going to attend the anti-slavery convention and make a speech. This is a cause that Real-Life Albert championed; he was the President of the Society for the Extinction of Slavery. Albert really did make his first public speech at an anti-slavery meeting at Exeter Hall in London in June 1840. 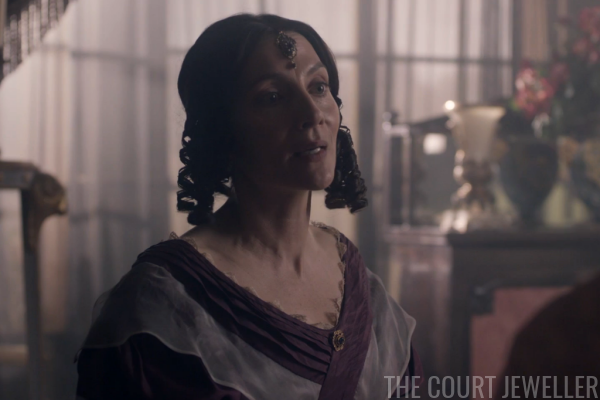 While hanging out with Emma and Harriet in the Ferronniere Fan Club, Victoria reveals that she plans to do something about Sussex's wife, Lady Cecilia Buggin (who actually went by the name "Lady Cecilia Underwood" until Victoria granted her a title). She's going to give her a title in her own right. 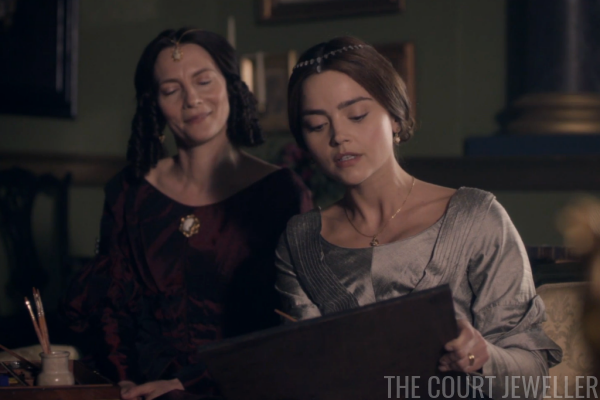 Emma gives Victoria the ultimate compliment: she says that she thinks Lord Melbourne himself couldn't have thought of a better solution. 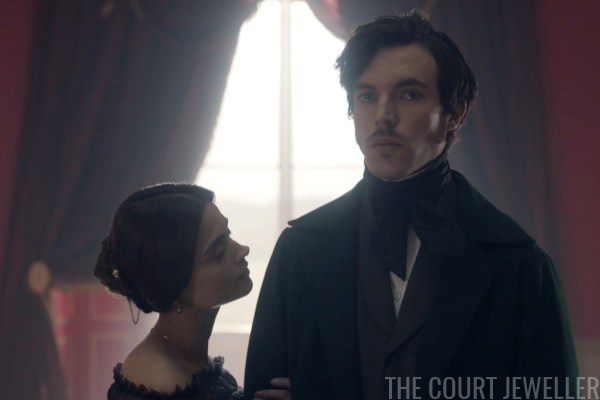 Victoria summons Sussex, who blathers about precedence and tradition until Victoria reveals that she wants to make his wife a duchess and welcome her at court. 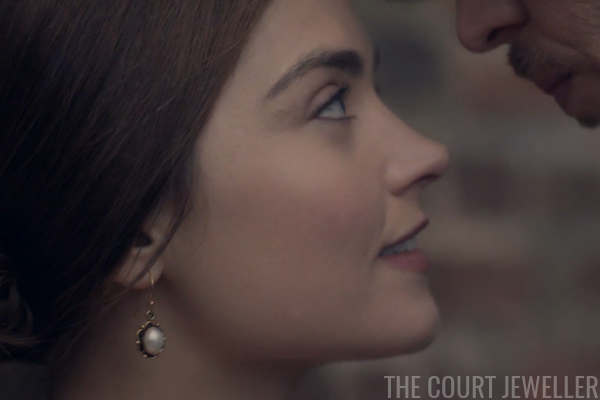 We get a good look at Victoria's little pearl earrings here, which also have seed pearls in their setting. It's clear that she has Sussex over a barrel as soon as they agree that it's important to recognize spouses. 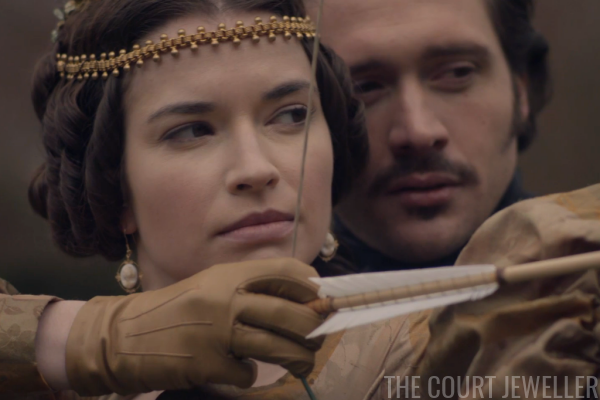 Ernst and Harriet flirt over archery. Victoria casually mentions to Albert that Harriet's husband is out of town. Oops! (I don't think that the real Ernst and Harriet had any sort of relationship.) Later, Albert lectures Ernst about pursuing a married woman and tells him it's time for him to head back to Germany. In other Coburg brother-related developments, Albert, who is now getting along swimmingly with his private secretary, practices his speech for the anti-slavery convention. 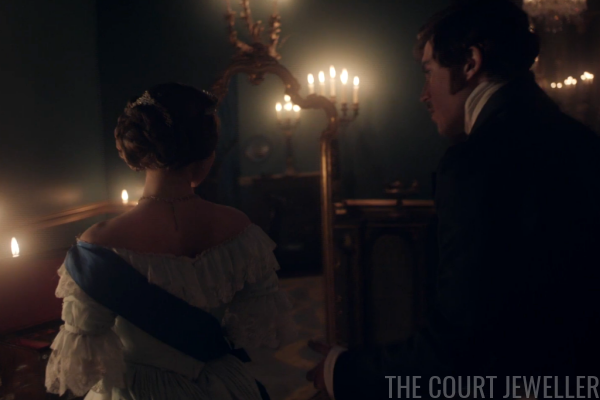 Victoria wears her lower-profile diamond tiara (which does not appear to be based on any real piece) to greet her uncle and meet her aunt. 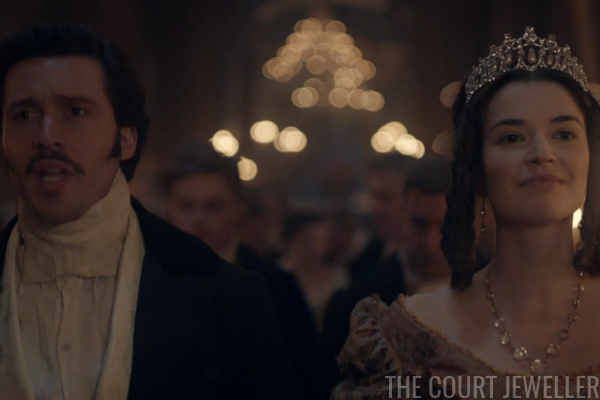 She's won the battle: Sussex stays beside his wife, allowing Albert to accompany Victoria in to dinner. Later, Ernst bids an awkward farewell to Harriet. 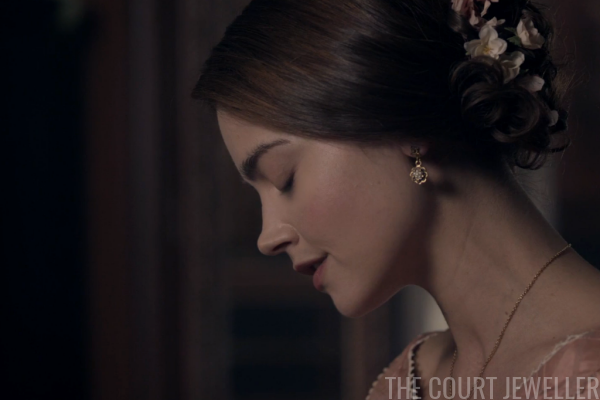 Victoria wears delicate earrings, a partially-hidden necklace, and hair jewelry to say goodbye to her brother-in-law. 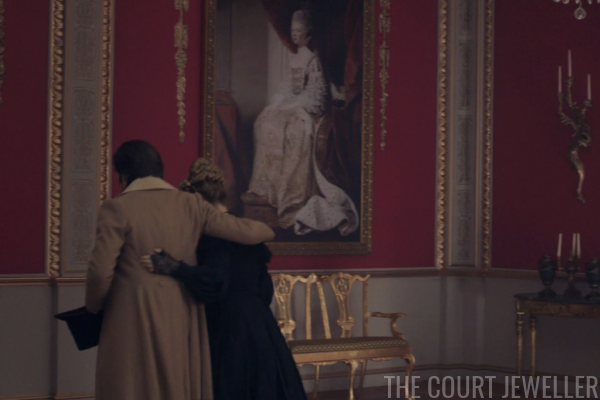 The Duchess of Kent sees Ernst out under the watchful eye of Queen Charlotte's portrait. Albert may have ordered Ernst to head back to Germany, but that doesn't mean he's happy to see him go. 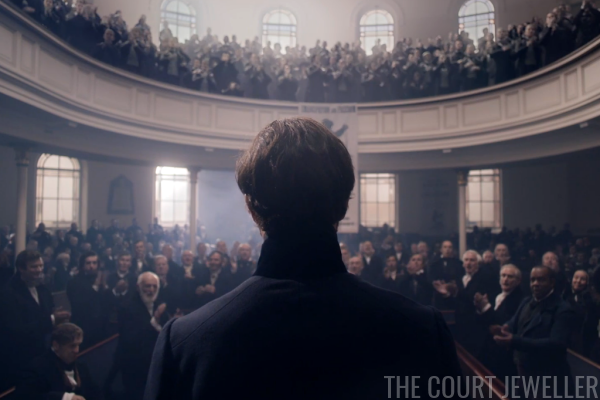 Sidenote: Tom Hughes is a very good on-screen crier. 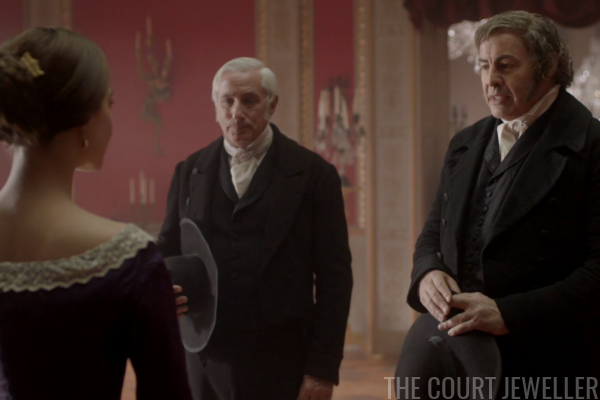 Ernst runs into Emma, Alfred, and Harriet on the way out. In a move pulled straight from a Victorian novel, Harriet casually drops her handkerchief at his feet as he leaves, giving him a token to remember her by. 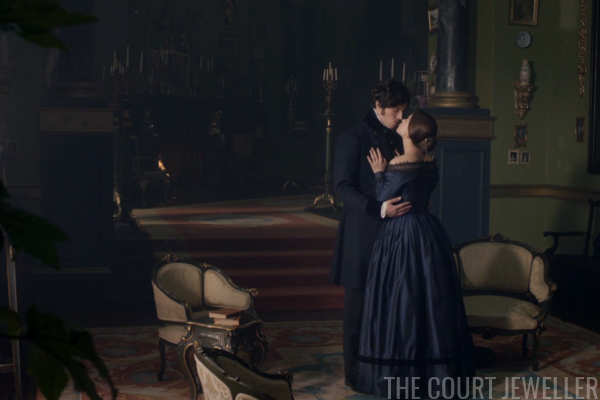 Ahead of his big speech, Victoria helps Albert with his pronunciation (and his kissing techniques). Albert's speech is a success. 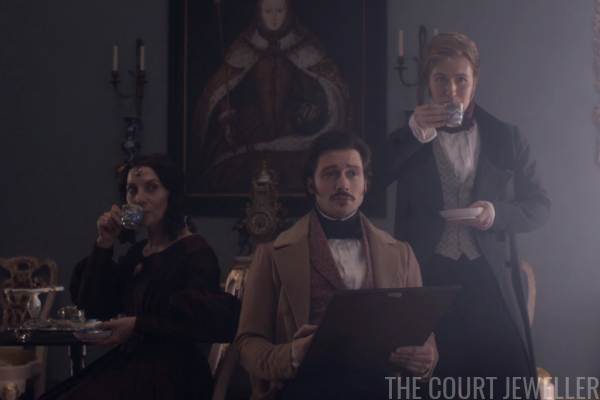 Although this show plays fast and loose with history in basically every single episode, I do like that they're giving us a view of some of the work that the real Prince Albert accomplished. 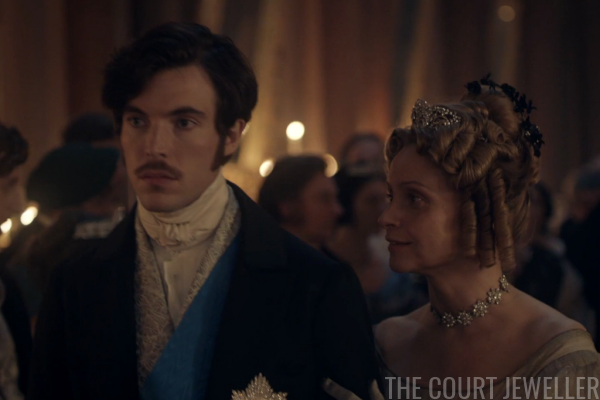 Back at the palace, Victoria is thrilled that the speech went well, but later, Albert finds out that she's been trying to delay motherhood. He explains that the only way to do so is to avoid their late-night canoodling sessions, and so she forget about the whole plan. Children ahoy! Stay tuned next week for more of the Adventures of Vic 'n Al!